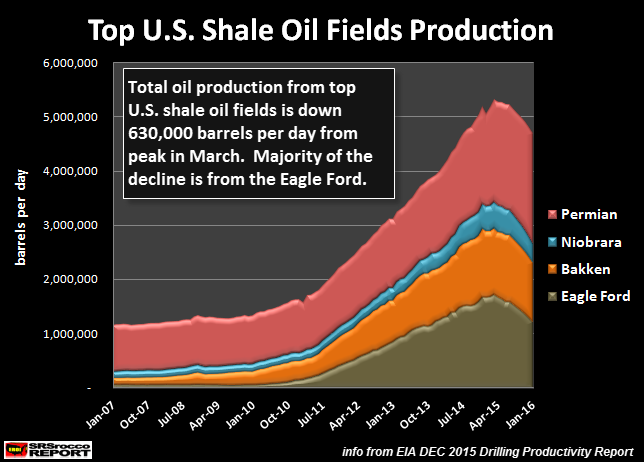 We no longer have to wait for the collapse of U.S. shale oil production, it already has begun. Unfortunately, this is bad news for the U.S. Government and domestic economy. Falling U.S. oil production will put severe stress on the highly leveraged debt based financial system over the next several years. The Eagle Ford Shale Oil Field in Texas peaked at 1.7 million barrels per day (mbd) in March 2015 and is forecasted to drop to 1.2 mbd next month (Jan 2016). Again, this is according to the EIA Drilling Productivity Reports which base their figures on estimates. However, even larger declines in some of these fields may be experienced when the real data comes out in the following months. 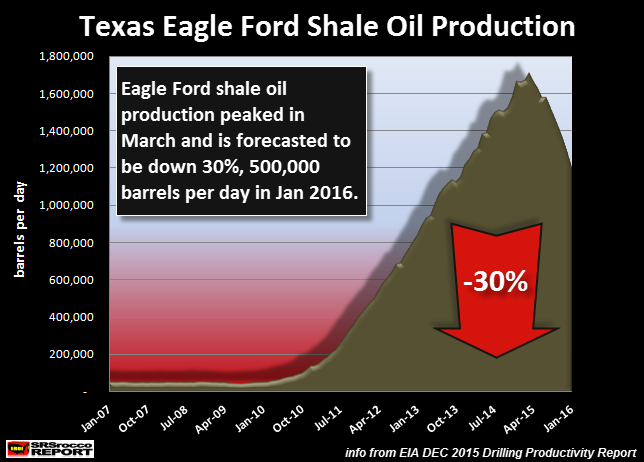 For the Eagle Ford to be down 30% (500,000+ barrels per day) in less than a year… THIS IS A BIG DEAL. I have been warning about the coming collapse of U.S. shale oil production for more than a year now. The idea that the United States would become energy independent is now DEAD FOR GOOD. Total U.S. shale oil production in January 2016, is forecasted to be 4.67 mbd, down from the peak of 5.3 mbd in March 2015. This is a decline of 630,000 barrels per day from the peak. Permian oil production is up compared to the other shale oil fields because a large percentage of the field consists of conventional oil wells. Thus, companies in the Permian are still adding conventional wells which is the reason production continues to increase. 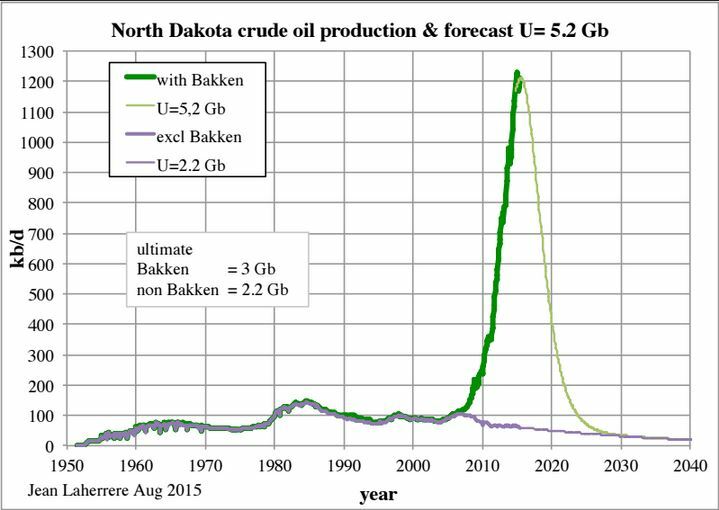 If U.S. shale oil production has already experienced a 12% decline in overall production, then the forecast for the Bakken (North Dakota shown above) will more than likely occur. Which means, overall U.S. shale oil production could fall 80-90% by 2025. This will be very bad news for the Fed and U.S. Treasury. No longer will the U.S. Government be able to buy foreign oil with paper Dollars or U.S. Treasuries. If we consider collapsing U.S. oil production and falling oil imports, the U.S. economy will be in a world of hurt by 2020… and in dire straights by 2025. This is the very reason why I believe physical gold and silver are the best assets to own during this time. Why? Because the value of most paper and physical assets (such as Real Estate) will collapse in value along with U.S. oil production. For those who think Solar and Wind power are going to save us… you can just FORGET IT. I will be putting out an article shortly why Solar & Wind are DEAD-ENDS and should not be counted on to provide the world with a large percentage of reliable energy production. 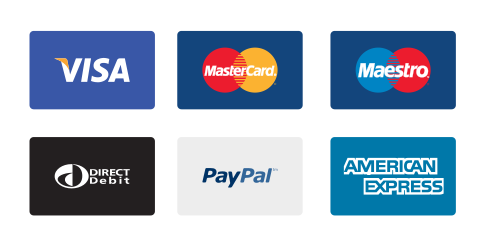 REMINDER: I have including a donation feature on the site for those who requested I do so for the public content. I have received many donations and thank everyone for their contributions. Just wanted to let new and old followers of my site know that I really appreciate the support.